Where Will NASA's 2020 Mars Rover Land? NASA's Mars 2020 rover may study ancient Mars by surveying the Jezero Crater paleolake. Presented at second Mars 2020 landing site workshop. MONROVIA, California — NASA's next Mars rover may touch down in a big crater called Jezero. The 28-mile-wide (45 kilometers) Jezero Crater emerged as the frontrunner among 30 or so potential locales during the second landing-site workshop for NASA's 2020 Mars rover mission, which about 200 scientists and engineers attended here from Aug. 4 through Aug. 6. 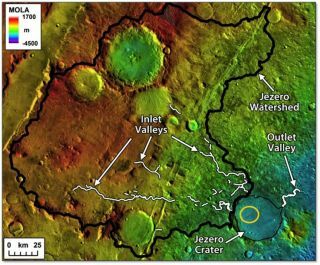 Researchers think that, by zeroing in on Jezero Crater — once considered as a touchdown site for NASA's Curiosity rover, which is currently surveying the 96-mile-wide (154 km) Gale Crater — the Mars 2020 mission could study and cache samples from one of the most intriguing regions of the Red Planet. Scientists and engineers gathered at an August 2015 workshop to assess where NASA should send its 2020 Mars rover. All that being said, Jezero Crater is merely the top candidate for now, not the official landing site. There will be more discussion and debate, and things could change between now and the rover's planned 2020 launch, said John Grant, co-chairman of the Mars Landing Site Steering Committee and a geologist at the Center for Earth and Planetary Studies at the Smithsonian's National Air and Space Museum in Washington, D.C.
"However, if there are reasons to delay selection" due to ongoing certification work or science interpretations, Grant said, "there could be a fifth workshop, with final site selection in 2019." NASA wants the 2020 Mars rover to traverse real estate likely to have been habitable. The six-wheeled robot will hunt for signs of past Mars life, fill a returnable cache with the most compelling samples and test out technology for follow-on robotic and human exploration of the Red Planet. In many ways, Mars 2020 will rely on proven technologies. For example, it will leverage many components of Curiosity's successful ongoing mission, including its entry, descent and landing system, and much of Curiosity's rover platform. As an added bonus, Mars 2020 engineers are evaluating a new Terrain Relative Navigation capability for potential inclusion on the mission. This system would help get the rover down into tricky terrain and also allow it to pick up the pace when driving across smooth portions of the Martian landscape. A schematic look at the Mars 2020 rover and its science instruments. Here at the Mars 2020 landing-site meeting, a novel tool was applied as a kind of "pro/con/more-info-needed" matrix to help judge each location. Called "The Rubric," it was invoked as an evaluation tool — a set of guidelines to establish a consistent, scientific set of standards that could be applied to each site. The Rubric was designed to systematically document site characteristics. It was not crafted as a scorecard. Still, competitive spirits saturated the room. The Rubric helped prune away some candidate sites, said David Beaty, chief scientist for the Mars Exploration Directorate at NASA's Jet Propulsion Laboratory (JPL) in Pasadena, California. "The Rubric is new," Beaty told Space.com, adding that the site selection for Curiosity's mission involved "a little too much emotion." "It's an attempt to move [site selection] to a higher intellectual plane and make things a little more comparable and hold people accountable," Beaty said of The Rubric. Some 200 researchers vote on sites that meet rubric criteria for NASA's Mars 2020 rover. "The science community process is impressive — ideas put forth, facts and interpretations argued and defended in a room of several hundred experts," said Scott Hubbard, a former NASA "Mars Czar" who is now in the Department of Aeronautics and Astronautics at Stanford University in California. He also serves as a member of the NASA Advisory Council. "The human spaceflight community will need to adopt a procedure like this to get the best landing site for people," Hubbard told Space.com. "The issue of planetary protection will continue to be a topic of debate," Hubbard added, referring to the effort to prevent Earth life-forms from contaminating Mars (and vice versa). "Where does Mars science leave off, and where does planetary protection start? What will the world do when we plan a human mission to Mars?" Considerable work has been done in characterizing potential landing sites for the Mars 2020 mission. Future mission planners can take advantage of all that labor, whichever spot is ultimately chosen for the 2020 rover, Grant said. "The other 2020 sites have utility for future exploration," Grant said. "In fact, that is the intent. Given uncertainties in what assets will be in orbit in the future, it makes sense to take advantage of them now to collect data on the most interesting candidate sites, discuss them and characterize the sites as best as is possible. We have not only been imaging the candidate 2020 sites, but have also had broader calls for candidate sites for a range of possible future missions and have been targeting those as well." Grant said that the plan is to have a "robust database of sites" for future missions regardless of what assets are operational when those missions are being planned. "The success of that approach emerged at this workshop, I think, where you saw the maturity of interpretations — detailed maps, etc. — for many of the sites [and] that enabled a level of discussion that was not possible at the same stage for prior missions," Grant concluded.